First thing I've bought in a year–since the move–that I don't really need, but just waaaanted. 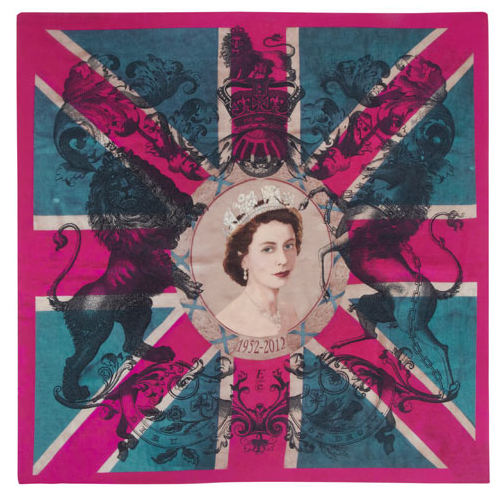 When I saw English Eccentrics Diamond Jubilee scarf–fuchsia and teal Union Jack, with the Queen's coat of arms framing her swan-necked coronation portrait–I fell hard. When I became a Canadian citizen, I took an oath of loyalty to her, not that she's taken me up on it. Could this be the moment? The scarf is 24 inches square, good tucker size for spring. (Also available as a 35-inch square and in several other colourways.) Price, £85 plus extortionate shipping, but in this rare instance I was beyond caring. Among contemporary images of the Queen, this is my favourite, by Canadian photographer Chris Levine. What acquisition has been irresistible for you? I totally understand why you couldn't resist this one. Love to see how it looks when on. This design tickles me. The teal and fuchsia are unexpected and quirky. I have "Her Majesty" jumping around my brain now, too. pseu: I'm wondering, is this kitsch to you? Duchesse, no no! It's really lovely. I probably didn't express that well, my mind went off in a different direction there, was thinking of mugs and tins and the like. pseu: I do think there's a element of kitsch in any commemorative item, as kitsch typically contains sentimentality. Isn't she lovely! Glad to hear that you give in to impulse occasionally, Duchesse. The last thing I found irresistible was also a souvenir, in its day: a 19th century "Grand Tour" gouache, in brilliant cerulean blues and apricot yellows, of Naples harbor with a wisp of smoke from Vesuvius in the distance. Discovered in a country antique store, it's fairly large and beautifully framed in gold, but I love it because it focuses on the harbor plaza--the paving and lighthouse--reducing human inhabitants, and Vesuvius itself, to tiny peripheral addenda. This gives the painting an oddly calm and spacious feeling, and it makes me happy every time I look at it. No doubt that beautifully designed scarf will do the same for you. P.S. The Land's End chambray shirtdress arrived, and it's a keeper for me: very authentic retro cut (including the darts I never seem to fill out) and good length and color (less blue than it appeared online, but still nice.) The fabric is thin, but all cotton, and fine for summer. If I didn't think the madras version would be too much yellow and too large a plaid for me, I'd order that, too. Thinking about this a bit more, I also think that coming from the US the sentimentality is coming from a different place than it would from someone in Britain, Australia or Canada. The Queen is iconic, but in a different way here. Susan G.: I thought about the all-blues colourway but found it more austere. Red/blue is s/o but I didn't want it anyway. c.: I too have tumbled for art. And also of course pearls. But thank god I got a grip before buying a Montana black leather jacket with a red eagle on the back (it was the '80s, ok?) at $4,000-then. I have no idea now why I wanted it. pseu: Many Canadians, even those not remotely monarchists, have a soft spot for the Queen (if not for specific offspring and their spouses) and she has returned that affection. Oh I never even knew that they made such scarf! I'd love to see it on you. There's going to be such fanfare in London with the Jubilee. You definitely chose the most pleasing colour way. All the others seem austere - but the fuchsia-teal is charming. And it's not kitsch - it's Liberty! Enjoy! I had been shopping for weeks for a very specific bag for spring/summer: light green, fabric as opposed to leather, cross-body strap, silver-tone (brushed or shiny fine) hardware, rounded shape but not slouchy like a hobo, just barely big enough for the necessities including my e-reader. Couldn't find what I wanted. Until I got through airport security and there it was, the exact thing I had described hanging outside an airport shop, and under my budget. It's Baggallini "Prague" in leafgreen/steelblue. And I adore it. It goes with everything in my spring/summer wardrobe, it's jaunty, and it makes me smile. 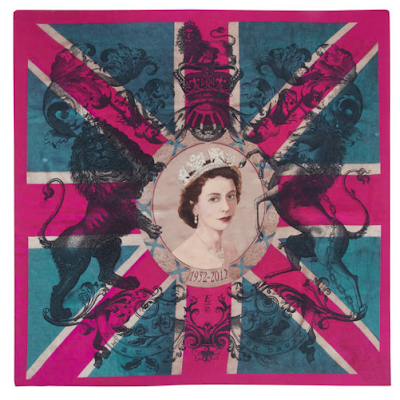 Anna: I have occasionally bought so-bad-it's-good kitsch but think this scarf sidesteps that, or I've convinced myself so. Kai Jones: Bagellini is a terrific line! (A travel store here sells them.) I'm no longer able to hoist a heavy leather bag, plus the colours are so appealing. Isn't it a delight when the perfect thing turns up! That is a fabulous scarf...she was indeed a beauty in her day, was she not! Glad you gave in to the siren's call...you would have regretted it otherwise. I fell very hard and very fast two years ago for Philippe Dumas' "Fairytales" (a/k/a "Scarytales") Hermes scarf. It cost me a small fortune but I love that scarf more each time I wear it and never regretted the purchase. I think it is a bit kitschy, but in a wonderful way. As you said "we are amused." Love the scarf. Good for you. I feel proud to be a Brit! I am on a strict budget right now, otherwise I know that that scarf would be mine ! Chicatanyage: One thing I'll say for very expensive shipping is, it's fast. Had it in my hands in three days. Silver Bunny: I now have it; the design is a delight, weight a tad light compared to Hermes- about the quality of Echo, etc. but in fact good for spring. I've taken to displaying it on my dresser, so does that double as an accessory and decor? Yes! I think this is PERFECT for you! Sly humor, elegance, a bit imperious:). Wonderful. The pink is a little bright but I love the blue. Suppose QEII would be offended to fill in the neckline of a denim blazer? RoseAG: IRL the colour is more deep raspberry (fuchsia) than shocking pink, which really oicks up my black and navy-as well as indigo denim. I suspect the colour was lightened a bit in the shot to show the detail of the portrait. Sarah: If you are outside the UK be sure to contact customer service to request your VAT refund; they do not automatically deduct it as do many UK vendors- it's about 14 euros so worth getting. They will issue the refund to your credit card once the scarf has shipped. New jewelry: Update and explore!